Disappointments. Failures. I hate those two words, and coupled together, they just send my senses to an absolute unmatched level of frustration. In any area of my life, I don’t handle any of these things very graciously. I let the very essence of them creep into my attitude and my thoughts. Lately, there have been disappointments and failures here on the homestead. I will begin with the most time-honored failure of mine…my chickens. I love having chickens. I love that my hens are all finally laying. I love having fresh eggs. I love having an abundance of eggs to share with family and friends. I hate when I fail to keep the wiliest of coyotes from picking them off for his breakfast every three days. I have been humbled in more ways than one by this nefarious creature. His latest exploits have had me running through my yard (barefoot) in my pajamas and through the cold rain, all while trying to figure out how I jammed the gun I intended to use to be rid of this nuisance once and for all. I am sure the neighbors shook their heads in shame and pity over the spectacle I made of myself. If you are keeping count with me, the total number for what has been stolen from me is: 2 roosters and 1 hen over the course of the last two weeks. 20 hens over the last year. He is about to send me into the crazy house. I garden every year. As in, I plant vegetable plants in the dirt every year and try to remember to water them daily in hopes of receiving some yummy and healthy food for me and my family. Well this year, I felt especially valiant in my efforts in that I decided to start my plants from seed. 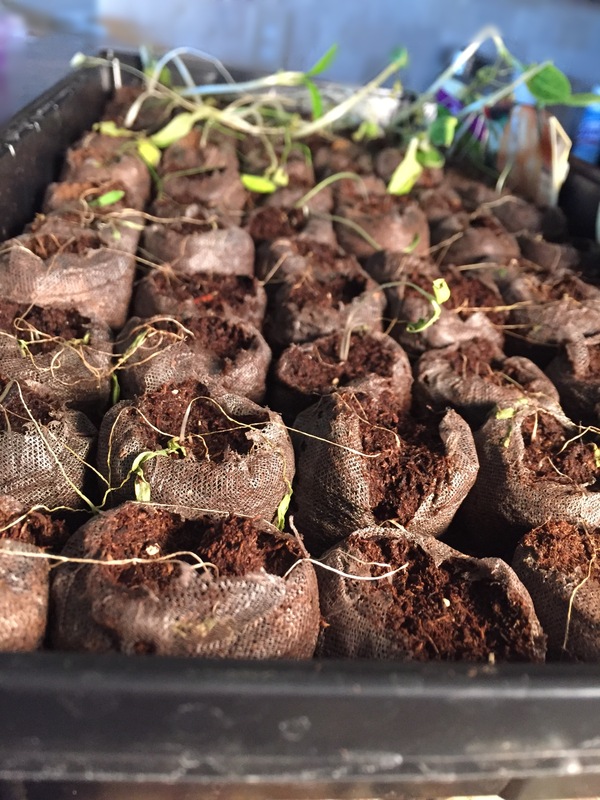 I was nervous at first, but then I saw little seedlings sprout. I saw these sprouts push through little pods of dirt and gloriously declared their existence. They were in such anticipation for the moment of their transfer to The Garden. Oh, but friends, as the green-thumb cultivates life so does the black-thumb bring death. One day my plants are alive and well; they are the very essence of hope and life. Then in the next day, while in the care of my incapable hands, they are the very essence of despair and death. It is pitiful, really. The money I spent to start my plants from seeds (you know, so I could try and save some money), has been wasted. I may as well have just burned it up…apparently like I did to my plants. Yes, I moped and I let agitation fester in my heart because of these situations. I may have said things I did not mean. I may have considered moving because I did not want to deal with the coyote. But, I press on. I will not let that coyote stop me from enjoying my chickens, even if that means I have to work harder to try and protect them. Soon, I will walk through those garden gates of my local nursery with my head held high as I pick out the vegetable plants for my garden I am so wanting to cultivate and grow. I will enjoy my little homestead and all that comes with it. I enjoyed the raw honesty of your article. I hope you were able to forge ahead. Persistence does pay off. I am new to your blog, so I haven’t seen – have you tried an electric line around your chickens, just the height of a coyote nose? I homestead in Kentucky. If you have any questions, feel free to ask. 🙂 I have learned so much from others and from my own mistakes, and I’m sure you are too. Oh, I forgot, I have a question I want to ask you too. I am designed a garden for a local daycare center, and I am thinking of making the beds out of corrugated metal. How are you liking your raised beds?